and How It Sells You Everything You Never Knew You Always Wanted. I have said before I don't like commercials that seem insincere or commercials that aim to make the tech elite look like the "common man," but there's something about the new Sprint ReadyNow commercials that feels good. Dan Hesse, CEO of the wireless giant, sits in a diner and tells me he wants to help me embrace the power of technology. And I believe him. Where the plan could fall short is on the retail level. Now that people think they can go in to any Sprint store and get top-notch, personalized phone set-up, the company must follow through. The helpful spirit and tech expert persona must be reflected by every sales rep on the floor. Personally, I think this is one of the most difficult challenges any retailer faces - turning their employees from cash-slingers in to true brand advocates. So, public relations is a different monster than traditional advertising, but it's definitely a large piece of the branding puzzle. Yesterday, MyEdcals, a top source for editorial calendars and story topics, released a list of what they believe will be the top story focuses of 2009, based on the over 100,000 opportunities they have in their database. No earth-shattering surprises here, other than maybe gift guides. But to be honest, I hope that is accurate because every year around the holidays I search for gift ideas and I'm usually met with a lot of junk. I guess you could say travel is a bit surprising in the top 5, since everyone seems to be pitching the idea of "staycations" lately (in fact, did you know this week is ABC's declared "National Stay at Home Week," to tie in with thier fall premieres?). Remember, this list is based on MyEdcal's available stories - so there is a good chance that it's somewhat skewed, but still interesting. Top marketers will be looking for creative ways to tie their offerings back to next year's hot topics. These ideas are going to be at the top of consumer conciousness and the themes can be applied to traditional marketing efforts as well as PR pitches. To capitalize on high membership rates and a desirable audience profile, LinkedIn has announced the birth of its own ad network. LinkedIn will launch the network, in conjunction with Collective Media, on Monday. The CPM (cost per thousand impressions) starts at an astoundingly high $30 at a time when most social networks are struggling to sell at rates of $1 CPM. Text ads are available at a lower cost. LinkedIn is able to demand higher rates because of their affluent and influential customer base. With an average household income of $110,000, 64 percent of LinkedIn members are male, the average age is 41, and 49 percent are business decision makers. The network will utilize partner sites. LinkedIn browsers will be cookied upon visiting the site. Members will be grouped into different, targetable categories to serve up ads on partner websites. Users will, of course, be able to opt out. A simpler way to avoid companies tracking your every move? Set your browser to periodically clear cookies. More details and stats at TechCrunch. New Microsoft Ads Missing the Mark, Dissing us "Real People"
I strongly agree with the TechCrunch analysis of the second Gates/Seinfeld Microsoft effort. These commercials are doing nothing but make Microsoft look more out of touch with what people want. After the pairing was announced and the first commercial aired, I commented to friends that the ads really did nothing for me because as a 20-something consumer (who, yes, owns a Mac, but is not a total PC-hater), I feel very little connection to Seinfeld or Gates and I certainly don't want to be like them. In fact, these two guys are about as square as it gets, and really are just reinforcing the image that the Mac Guy ads have created for Microsoft. But…If Bill (and therefore Microsoft) is not already in touch with real people, then their products may not be, either. By spending time with real people, the logic flow suggests they’ll be able to build better products. In other words, Microsoft is highlighting the fact that they are out of touch. But instead of saying they’ll mingle with real people to build better products, the message seems to be that the real people need to get with the program. A report from Meredith Corporation on Marketing Charts this week says that there are upwards of 55 million "Gamma women" out there. 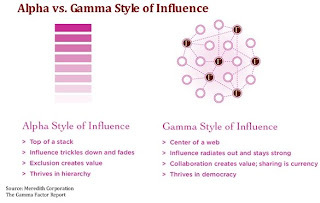 A Gamma woman is someone who influences a wide network of consumers and generates and disseminates new ideas and trends. Basically, an influencer who's a woman. For a more indepth look at the 5 Profiles of Gamma women, read the full article here. A few months back I referenced the Minority Report-esque "electronic newspaper" in a blog about the future of news. It seems today we come one step closer to this futuristic dream- Plastic Logic announced it's e-news reader which mimics the look of a real newspaper. The reader uses the same technology behind Amazon's Kindle and similar readers, but in a much larger size, equal to a piece of copier paper. The device can be updated via a wireless link and stores hundreds of pages of information. The reader goes on sale early next year. Plastic Logic is expected to present more information, including the price and planned news organization partnerships, at the International Consumer Electronics Show in Las Vegas in January. Electronic readers offer the opportunity to collect more information on subscribers, leading to targeted advertising campaigns. They also hold the promise of a greener news industry and would significantly reduce operating costs for news providers. With the slowing economy, spenders are more likely to carefully research purchases, often turning to the internet to score the best deals. Price remains the major influencer, with 64% citing this as the most important factor when making an online purchase over the next 12 months. 62% of respondents said they are now more likely to consult reviews written by other web shoppers before buying. Most (69%) search by product name when looking to purchase online, with brand names the next most searched for (43%). Women are more inclined to reduce overall spending during the economic downturn, but they are more likely to consult online reviews than men (64% vs. 58%). When comparing the different age groups, it is the “silver surfers” (age 55+), many of whom have paid off mortgages or enjoy higher disposable income, who are the least concerned about the economic situation: 43% said the economy would not affect their spending. They are followed by the 16-24 age bracket: 37% wouldn’t change their spending levels. Laura works in Marketing for a technology company in Atlanta, GA.